during the main summer months. The Arctic circle is located south of the Arctic town of Bodo & the Lofoten Islands, and north of the Helgeland coast. One of the best ways to experience this phenomenon is on a cruise along the spectacular Norwegian coast, offering the most exceptional Arctic scenery like the Lofoten Islands, the North Cape & beautifully located Arctic towns like Bodo and Tromso. 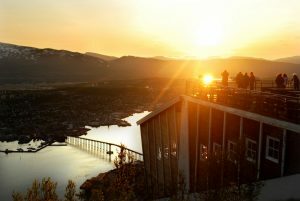 You can also join an amazing round trip from Oslo, including the unforgettable Arctic Nordland rail line, Bodo, the Lofoten Islands & the Helgeland coast. occuring at the same time each year in the Arctic areas of Norway. The sun stays above the horizon through the entire night, the night is quite bright, and those not used to the phenomenon might find it difficult to sleep.